One may wonder how this group of men from hundreds of countries, gathered in this beautiful hall, can truly understand itself, given that each person brings with himself a cultural baggage that necessarily influences his understanding, the way he interacts, and the way he intervenes. We met with Father Arturo Sosa, a Venezuelan, and we asked him this question. 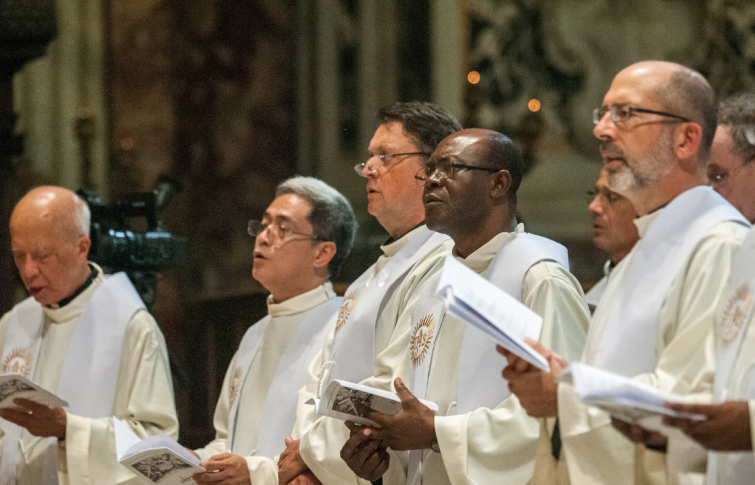 If cultural differences are real, those gathered at the General Congregation also have a common baggage, the one linked to their experiences of the Spiritual Exercises and their practices of discernment. They have a great desire to hear the same voice, that of the Holy Spirit. This is also what has been felt in recent days, leading to the first major decision taken by the meeting: to allow more time before starting the four-day murmuratio that will lead to the election of Father General. This exercise has made space for the Spirit and, perhaps surprisingly, led to an unanimous decision that involved a change in the program that had been planned by the Coordination Committee. Even when it is true that the CoCo [Coordination Committee], responsible for the proper functioning of the work, should make proposals, the Formula of the Congregation allows for much flexibility for members to organize their work. The common feeling that has been experienced – gradually formed by listening to the Spirit in the days that we have just experienced – has pushed members to ask for time enough before the Murmuratio begins. We are 212 electors; those of us who know the most electors, upon starting the process, know at most only a third of them. Some do not personally know anyone since they have not had the chance to participate in this kind of international meeting of Jesuits. We have clearly expressed the need for more time in order to grow in mutual knowledge. There was already, in the method that we have used, a procedure that encouraged this knowledge of each other. Ten times we have found ourselves in a group of a dozen or so of companions, and every time we have met some new companions. But these gatherings of 90 minutes were somewhat short, after all. If English is understood by the vast majority of participants, it is often the 2nd, 3rd or 4th language of many; the same goes for Spanish or French. It is not sufficient therefore to use a common tongue [fr. langue –lit, tongue] for the type of work that falls to us; we must arrive at a common language [fr. langage]. This is our challenge: to use a common language that will allow us to listen to each other while, at the same time, allow the Spirit to speak. Indeed, the Holy Spirit does not speak directly; he always speaks through human voices, through each one of our voices.